Where is ESAT re: Erroneous Map of Ethiopia? Eritrea’s sovereignty and independence are sacrosanct!! However, ‘some’ Amhara elites are yet trying to re-write our history through the deliberate promotion of anti-Eritrean statehood maps and interviews. But why? Can ESAT play a positive role in this? My name is Araia G. Ephrem, and I’m an Eritrean-American living in California, USA. I am one of the many Eritrean-Americans who supported ESAT since its inception. Also, I was a contributor in ECADF political PalTalk chat room. I follow your programs consistently, and I applaud your success in reaching a vast majority of the Ethiopia public. However, I am alarmed at your absence in attempting to constantly educate the Ethiopian public about Eritrea’s sovereignty. 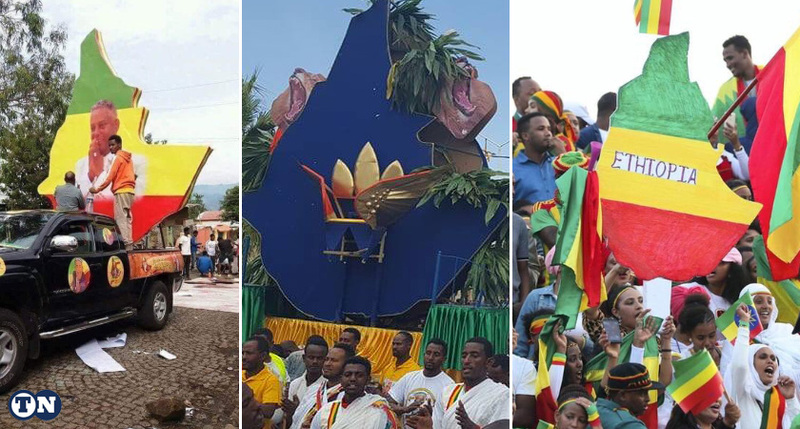 Although it may not be ESAT’s mandate, I strongly believe that ESAT should correct many incorrect information decimated by Ethiopian officials disregarding facts about Eritrean sovereignty, Eritrean flag, and Eritrean map. These misguiding in-corrections come constantly by posting wrong maps of Eritrea and Ethiopia; stating false history of the Eritrean struggle and etc. I’ve not heard ESAT attempt to challenge such in-corrections and educate the public. Such incorrect facts are highly offensive to Eritreans living everywhere on the globe. Furthermore, it may give young Ethiopian generation a wrong concept of the ongoing coordinated effort to bring a lasting peace in the Horn of Africa. Actually, at times it seems it’s done deliberately and it could nurture future wars between the Eritrean and Ethiopian coming generations. My sincerest belief is, ESAT doesn’t stand for such an ugly future, and all its effort has so far mended many fences between the Eritrean and Ethiopian people. However; if we continuously slight such wrongs, then it may create havoc in the future of the region. This is especially concerning when incorrect maps are posted by formidable persons of your organization such as Tamagne Beyene and Mesay Kebede. In fact, the Ethiopian Ambassador to the UK twitted the celebration of Marathon runners in Dubai. He actually posted a picture showing Ethiopian fans declaring an Ethiopian map inclusive of Eritrean map. After a response from many Eritreans, the twitter post was removed. Must we go through such unproductive mindset? Your thorough attention is required and a must in this regard. I will appreciate your prompt response regarding this matter. #Ethiopia /ns including state reps persistently sending appalling views that appear to overlook #Eritrea sovereignty shouldn't be misconstrued as a 'unification in the making'. Fact: #Eritrea sovereignty isn't about what's said in a PR colloquial. It was achieved with blood!